Forgive the pun, but Hurricane Irma hit a little close to home for me as it pounded Florida. My father and stepmother live in Melbourne, FL, and earlier in the week I flew down to evacuate them after they had to stay for a doctor’s appointment late into the week. As we flew back toward our home in Tennessee, the interstates were packed with cars as far as we could see. The storm ended up sparing most of the State, but those in the southern areas were devastated. I knew I wanted to do something, but thought, “What could I accomplish by myself?” I had read stories about Operation Airlift and what folks with General Aviation Aircraft were doing down in Texas after Hurricane Harvey. Volunteers from around the country were flying supplies in their own privately owned aircraft right into the heart of those areas that need them most. This was vital as trucks couldn’t access a lot of areas. Wendy and I had flown a relief flight with a similar group, AeroBridge, a year or so earlier after severe storms and flooding hit South Carolina. 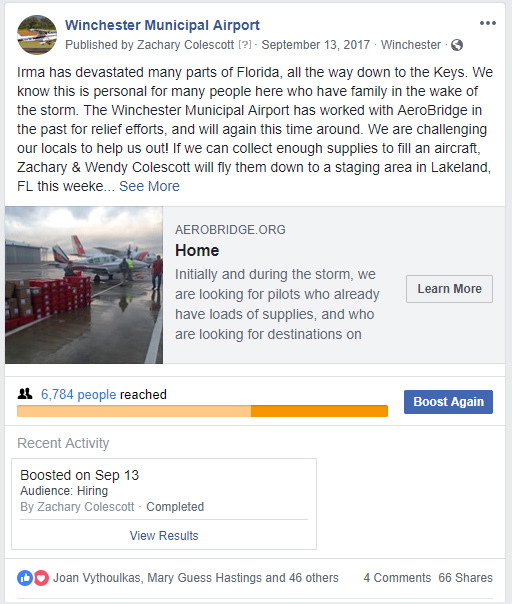 Following Irma, I received a message that both AeroBridge and Operation Airlift were getting mobilized to help get supplies to ravaged areas in Southern Florida. That’s when the idea hit me. I had an aircraft sitting on the ground that could carry a load upwards of 1,400 pounds. In the grand scheme of things, that may not be a lot…but every little bit helps in these situations. I put the word out via the Winchester Municipal Airport’s Facebook page, and the support from the local community was both quick and amazing! Donations started pouring in from individuals and groups alike. Everything from bottled water to pet food to toiletries started to show up. It wasn’t too long after that we’d collected more supplies than my one aircraft could handle! I put the word out to any other volunteers who would be flying down to Florida empty to see whether or not they could stop in and pick up a small amount of supplies. Pilots and aircraft owners are amazing as I easily found a few who could help carry the load. Once the supplies were in place, we set about organizing, reassembling, and weighing it all. Afterward, we loaded as much into the Lance as she could carry, fueled her up, and tucked her away in the hangar to await her early morning mission. I arrived to the airport before the sun rose, opened the hangar, and set about my preflight routine. It wasn’t long before I was in the air and headed toward Lakeland, FL where I was to deliver my precious cargo for redistribution. I must say, the Lance (as well as the entire PA32 line) is an amazing machine. Even though I had carefully prepared a weight & balance for the flight, I was easily at max gross weight. The plane didn’t care one bit, and launched into the air as if she knew her mission was an important one. The flight to Lakeland was by all counts uneventful. I watched the sun rise in the east, a rain shower in the west, and listened to the near countless “Compassion Flight” and “Angel Flight” call signs being used when talking with air traffic control. (Compassion Flight was a call sign utilized by AeroBridge to identify volunteer aircraft) It really was impressive the amount of folks like me who just wanted to do their part to chip in. I arrived at Lakeland to see several other aircraft in various states of loading or unloading. I shut the aircraft down, and was greeted by two other volunteers. They helped my get all of the supplies unloaded while we waited to see what the next step was going to be. The person who was in charge walked over and asked what my plans were. I told him I could be wherever he needed me to be. He responded that he was grateful that we got the plane unloaded, but that we were going to load it right back up, along with some additional supplies, and I would be rerouted to Homestead, FL, near Miami. After reloading and refueling, I took back to the skies once again with my precious cargo. During climb out, I experienced a malfunction which quickly got my attention. My CGR-30P engine monitor quickly alerted me to the fact that my fuel flow had dropped to zero gallons per hour. I looked around, saw a lot of swamp land out the window, and got very nervous. I worked the problem, realized that every other indication was showing normal, and diagnosed the issue as a loose connector. I’d experienced a similar issue before and was fairly certain I was experiencing a simple, yet momentarily scary, inconvenience. The rest of the flight proceeded without incident, and I landed in Homestead about 45 minutes later. The relatively small airport was abuzz with activity. I taxied in front of a hangar that was temporarily housing supplies that were being flown directly into Summerland Key, just outside of Key West. I unloaded my supplies and watched them get loaded right back onto a waiting Cessna 208 Caravan, surely a superb aircraft for what was going on. I’ve flown the Caravan a number of hours hauling skydivers, and I wished I’d had one for this mission. I could’ve easily carried five times the load I had in the Lance. After unloading, I set about repairing the loose connection on my fuel flow transducer. I quickly found the problem, and, with the help of a volunteer A&P, had it fixed in no time. When we were finished, the mechanic asked me where I was headed next. I told him that I didn’t have a particular plan and just wanted to go where I could help. He informed me that there were two first responders at the airport who had just been airlifted back into Homestead after being some of the first boots on the ground in the Keys after Irma had passed. These two gentlemen were trying to find a way to get back to their vehicle which they had left in Lakeland. I would learn later on that these two had also responded to the need in Texas after Hurricane Harvey, and after they were no longer needed there, immediately drove all night long to get to Florida where they would be called on once again. It wasn’t even a question…I happily told the mechanic that I’d be happy to fly them back to Lakeland if it meant they could get home to see their loved ones that much quicker. I refueled once again, loaded up my two passengers, and we were on our way. An interesting side note to this part of the story is that I had nearly removed all of the seats from the aircraft in order to accommodate all of the cargo; however, something made me leave one of the seats in the back installed. If I’d removed it, I wouldn’t have been able to complete this part of the mission. The universe works in strange ways sometimes. After safely transporting my passengers to Lakeland, my work was done for the day. After refueling one more time, I set out for home. Again, it was an uneventful flight back to Tennessee. Cruising along at 12,000 feet, it was a good opportunity to reflect on the day. I had done more than I had set out to do, but I knew it paled in comparison to the two I had just delivered. Three and a half hours later, I arrived back into Winchester, just as I’d departed some sixteen hours earlier, in the dark. Several days later, I was informed that general aviation aircraft owners and pilots (just with our organization) had moved more than 30.5 tons of critical supplies, getting them directly into the hands of those needing them the most. Mission Accomplished.